Fees associated with filing patent applications in Argentina as well as other patent fees are available in the fee calculator. The term for filing a patent application in Argentina claiming priority is 12 months from the date of priority. The restoration of this term in Argentina is not possible. The official language of a patent registration in Argentina is Spanish. The application may be filed in any other foreign language; however, its sworn translation into Spanish should be submitted within ten working days from the date of filing. details of priority claim (if applicable). A Power of Attorney form should be notarized and legalised by apostille or by Argentine Consul. The original POA should be provided within 40 business days from the filing date. Patent applications in Argentina undergo formal and substantive examination. The substantive examination must be requested within 18 months from the date of filing a patent application in Argentina. In Argentina, the disclosure of an invention will not disprove its novelty if the disclosure occurs within one year prior to the filing date of the patent application, or where applicable, the recognized priority by the inventor or his assignees via any means of communication or by displaying the invention at a national or international exhibition. On filing the application the corresponding substantiating must be provided. Patents in Argentina are valid for 20 years from the date of filing. The official grant fee for a patent in Argentina should be paid within 30 days from issuance of the Notice of Allowance. The first annuities should be paid after the patent grant starting from the third year of application date. It takes an average of between 4-5 years from filing to granting of a patent in Argentina. 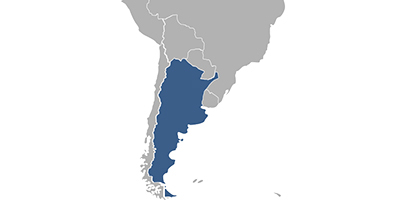 It is possible to obtain utility model protection in Argentina. Utility model requirements are less stringent than for patents - novelty must be present and they must be industrially applicable, however, an inventive step is not a necessity. Applications undergo both formal and substantive examination. The validity term of a utility model in Argentina is 10 years from the date of Argentinian filing, which is non-renewable. Only one independent claim is accepted for Utility Model application in Argentina. For foreign patent applicants, it is necessary to perform patent prosecution in Argentina through an attorney or agent registered in Argentina. 1. Online Database for Argentine Patents Search. 2. Argentina is not a member of PCT; thus, the delays permitted by PCT national phase entry procedure are not available in Argentina. The application may be filed by the national procedure only within the term of 12 months from the priority date.